Compassion, the keen awareness of the interdepence of all things and the ultimate and most meaningful embodiment of the emotional maturity. It is through compassion that a person achieves the highest peak and deepest reach in his or her search for self-fulfillment. Compassion may be defined as 'shared suffering' (the lowest level), 'to share a meal' but also 'shaking hands'. The moment of exchange counts. If you have the bacilli of passion or obsession, you will defeat life. compassion in times of cancer and of aids. This seminar, called "Compassion, The Art of an Ethical Problem", organized in 2007, from 17 up to including 21 October by the NEXUS Institute, brought the following questions at the centre: What aesthetic and moral impact does compassion have on art and society? Can compassion in art lead to a kind of moral education? Is it possible to build a society or a legal system based on compassion? Can a lectio magistralis on Greece and her heroes let listen a whole public with bated breath? Yes! If the speaker's name is George Steiner, a learned man and intellectual of world-reputation in the field critics on culture and literature. George Steiner choosed as theme "A Long Night outside Troy" (Achilles, Hector, the killings, the bull). A continuous college of almost two hours in front of a delighted and affected public on the theme 'Achilles' compassion during the long night outside the walls of Troy, inspired by the famous last song of the Iliad, where the meeting between the Archaic hero and Priamus, king of the burning Troy and father of Hector, who was perished by Achilles, is at the centre. Afterwards there was conversation with Ingrid Rowland, expert on the Classics, Renaissance and Baroque and George Klein (biologist and humanist). More than hundred listeners attended the first lecture out of series at the Venice International University concerning the theme 'Compassion in Art'. The writer George Steiner - famous by his book 'Una certa idea d'Europa', wherein the old continent is identified with coffee-houses, full with people and conversations, where verses are written, where is conspired, philosophized and where one is practizing in civilized conversations, lectured on compassion in art and the capacity to bring forward a kind of moral civilization. And that was done to involve one of the most recalled pages from world literature, wherein the most rigid hero of one piece got affected at the look of the tears of the old man who is asking back the body of his son. Compassion is suffering together, said Steiner, when he described when Achilles and Priamus joined the meal together and he added that 'sharing food is the highest expression of human civilization. Jean Claire lectured on "Art and the Pietà" and guided us to San Marco and Gallery dell' Accademia for an excursion to deepen the fascinating mystery of the art by Titiaan and Bellini. After lunch, some time to go to the yearly La Biennale di Venezia and the basilica Santa Maria Gloriosa del FRARI. 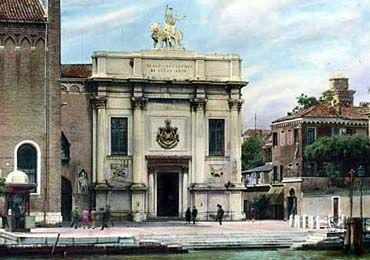 In cafe Florian, plaza San Marco in Venice, we coincidently met Jean Clair, on the watertaxi to San Servolo George Steiner and Ingrid Rowland. Afterwards we also did have drinks and some conversation on a terrace near the Galleria and had beer in Harry's Bar (Wagner) and a dinner near San Marco. If someone has dreams to have college and to have the former director of the Picasso museum as guide: that dream came out. Mr. Jean Clair gave explanation about the pietà (a representation of the suffer of Jesus) situated on the left side above a side entrance of the San Marco. The last lecture was given by Mitchell Cohen on "Wagner and Compassion". 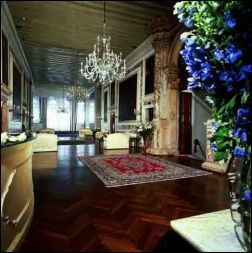 To let feel twinklinks of the German composer, theatre director, polemicist, and conductor Wagner, there was also a visit to his house Palazzo Vendramin-Calergie, a palace on the Grand Canal in the sestiere (quarter) of Cannaregio in Venice. The architecturally distinguished building was the home of many prominent people through history, and is remembered as the place where composer Richard Wagner died. For the participants, the seminar ended with a 'Wagner"-dinner: entrée in memory of the dinner Wagner, shared with the great revolutionary leader Mikhail Bakunin, a 'dish of the Doges', pheasant, an Alpine meadows cheese platter and a dessert of ice cream, with baicoli biscuits and almond brittle.